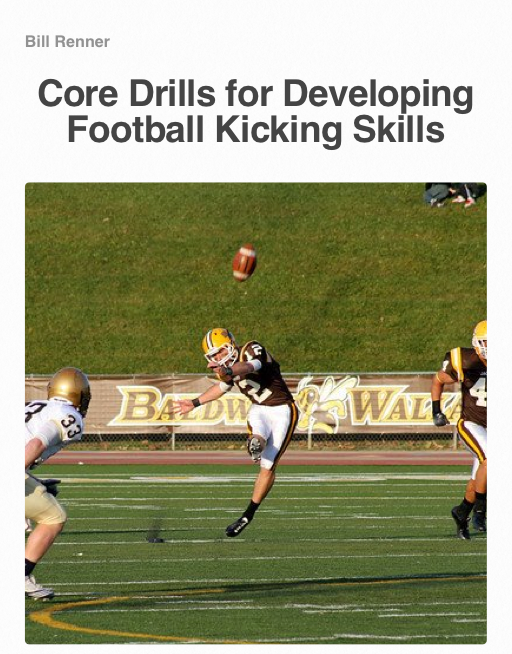 Get Core Drills for Developing Kicking Skills for your iPad or Mac here. Second or third chances do not come often for kickers who fail to execute their skill. Offensive and defensive players can fumble, throw interceptions, miss blocks, get knocked down, miss tackles, drop passes, fall down and jump off-sides, yet, will only be considered to have “had a bad day”. Their abilities and position on the team will not be questioned. This scrutiny and “perform or get cut” mentality from the coaches and fans demands a higher level of skill performance for kickers. Successfully combating this condition depends on the degree of technical knowledge the kicker possesses and how quickly adjustments can be made after poorly hit kicks. The epitome of mastering this mental training is Tiger Woods. Rick Martino, director of instruction for the PGA of America, caught a comment Tiger made after shooting 40 on the front nine of his record setting 12 shot Masters victory in 1997. Just a glance at most professional kickers biography will produce a litany of teams they have performed for and been cut from. The ones that reduce this experience are the ones who have learned to correct mistakes immediately like Tiger Woods. 2) a knowledge base of how to kick a football allows me to coach myself to correct my mistakes. Without an understanding of the essential techniques that make the ball fly where and how you make it, fixing technique errors, whether “on the fly” or over a long term is impossible. I have witnessed many talented kickers over the past 24 years as a player, coach, and operating punting and kicking camps. The ones that could perform under pressure and on command were the ones with the greatest understanding and control of the mental aspect of the skill. How do you gain this knowledge? 1. Learn from experienced coaches and players. If the technique you are being told to do does not contribute to these results then it does not matter if you do it that way or not. PERIOD! There are only certain essentials that must be executed to be successful at these skills and all the rest do not matter. In fact, those “essentials” are similar for both skills. There are not a lot of techniques to learn to kick well. But focusing your attention on the wrong ones will prevent your maximizing your ability. These questions will help you discern what those are. 2. Watch the ball fly and learn from what it does. The flight of the ball is the best indicator of technique errors. An experienced instructor does not need to see you physically kick the football. He can watch the ball flight and tell you what you did at the collision to cause the football to fly the way it did. With an understanding that the essential techniques are limited and what their cause and effect are correcting technique errors from ball flight is not a difficult process. 3. Develop a strong desire to master the skill. Anyone can be taught to kick a football adequately. Few can be taught to do it on command. The desire to “BE THE BEST” is one factor that permits players to continue to advance to higher levels. The desire must translate to a strong work ethic. Bill Renner has put together an interactive kicking manual that will help you develop a kicker right now. This illustrated manual includes 7 interactive, animated presentations that illustrate the coaching points and feedback to successfully kick the football. 12 movies illustrate the correct technique being descirbed in each chapter, and three movies give a telestrated, voice over of Coach Renner explaining the skill and the drills. The training guide provides a recommended work out for kickers as well as a syllabus for all situations that a successful kicker must know and understand. This illustrated manual includes 7 interactive, animated presentations that illustrate the coaching points and feedback to successfully kick the football. 12 movies illustrate the correct technique being descirbed in each chapter, and three movies give a telestrated, voice over of Coach Renner explaining the skill and the drills. The training guide provides a recommended work out for kickers as well as a syllabus for all situations that a successful kicker must know and understand. Years ago I heard now retired coach Wally Hood present a clinic on the kicking scrimmage. This special teams focused scrimmage format allowed a team to work all phases of the game, but gave emphasis and most reps to the special teams. When I became a high school head coach this was something I implemented with my teams, and we also did this at the college level. I’ve used a number of different variations of tho scrimmage format over the years, but my favorite also emphasizes third down offense. Depending on your situation, you can choose the teams, or you can select captains and allow them to choose the teams. I like the players selecting the teams because it gives them ownership, and gets them thinking about who the best special teams players are. This helps emphasize the importance of special teams in their minds. Kickers, punters, and long snappers are obviously drafted early, and when you let the whole team be involved in the draft, it’s good to see the specialists valued by their teammates. After the teams are selected, players need to be put on units. Again, I like to give ownership to the players, but also understand in this area they need guidance. I usually have a different coach in charge of each unit of special teams, so each one would work with both teams to help them put together their units. We do the same with offense and defense, ensuring that all players have an opportunity to perform in the scrimmage. This is another opportunity for the team to realize the value of work on special teams. Usually the kicking scrimmage serves as the second practice of the day during two-a-days. We give each team time to practice and go over their units (with coach supervision) at the end of the first practice, and as a walk through before the scrimmage. The very rare fair catch kick may be something that wins you a game. Many coaches aren’t aware of this rule, but it does exist in high school football and the NFL. The rule does not apply in college football. Here’s the last time it was attempted in the NFL in 2008. According to the announcer, the last time it was successful was Chicago in 1968 against Green Bay, though I have found another source saying the last successful attempt was in 1976 by Ray Wersching of San Diego against the Buffalo Bills. Either way, it’s a rare play. As you can see Rackers shanked the kick and the Giants could return it. For this reason, the team that is attempting the free kick must cover in order to prevent a return. More on this later. ART. 3 . . . A free kick is any legal kick which puts the ball in play to start a free kick down. After the ready-for-play signal and before the kick, each player other than the kicker and holder for a place kick must be behind his free-kick line. A free kick is used for a kickoff, for a kick following a safety, and is used if a free kick is chosen following a fair catch or awarded fair catch. ART. 7 . . . A place kick is a legal kick made while the ball is in a fixed position on the ground or on a kicking tee. No material or device may be placed on the ground to improve the kicker’s footing. The ball also may be held in position on the ground or on a kicking tee by a place-kick holder who shall be a teammate of the kicker. 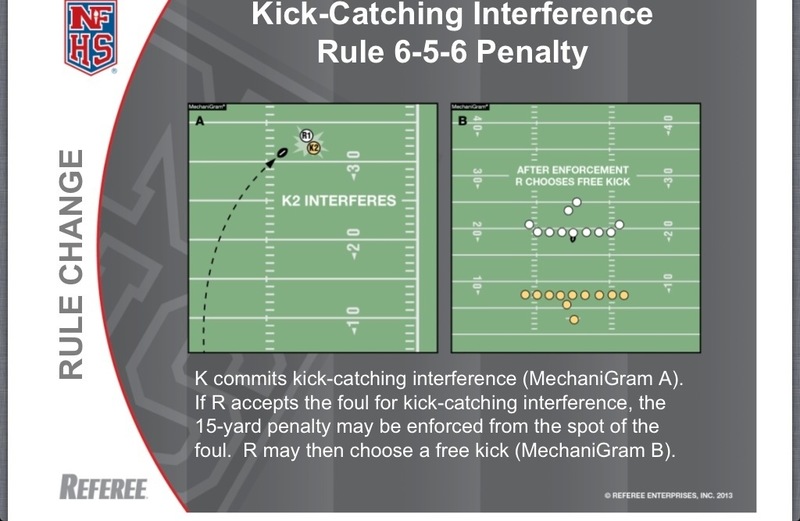 A place kick may be used for a scrimmage kick, a kickoff, a free kick following a safety or for a free kick following a fair catch or awarded fair catch. This is a situation that I had my teams practice every week. In my second year as a head coach, I almost called for it, but we determined that we would be out of range. Though it is something you may never use, it’s best to have your team prepared for this in case you do decide to use it. The following video is a good example of what needs to be covered with your team in order to pull it off. Each point will be discussed in detail. Obviously, the first thing that needs to happen is that you pin your opponent deep and force them to punt. This is where you probably should have a specific play call for this on the return. We simply called it “fair catch for free kick.” From a strategy standpoint, you will still want to have at least one rusher in the case of a bad snap. You will also want to consider putting two returners back. You should have an idea of what type of punter the opposing team has and where to place your returners. You will want your returners to be spaced properly so at least one of them can make the fair catch. If the punter you are facing likes to kick it straight away, then you may want a returner deep and a returner short. Again, this is where some special teams scouting and game planning is important. After you have successfully executed the fair catch, now you have the opportunity to align for a free kick. The ball may be placed anywhere across the line of scrimmage, so your kicker does have the opportunity to line his kick up wherever he wants it on the line of scrimmage. You will want to use your kick off unit to do this because the ball is live after the kick and can be returned by the opposing team. In high school, the kicking team is allowed to use any legal tee including the tee used for kick offs. The point we always stressed with the rest of the unit was to not go offside. Because the distance they were covering was less than a typical kick off we had them stay back and see the kick instead of trying to time it up to be as close to the line as possible. The “receiving team” must be at least 10 yards past the line of scrimmage exactly like a kick off. If you are on the opposite side of a free kick, the important thing to remember is the ball is live. If for some reason it is short or is shanked, the kicking team can recover and get the ball at the spot they recovered. Obviously with time left on the clock this is something you do not want to happen, so be sure to recover all free kicks. Any ball caught or recovered in the end zone by the receiving team will be ruled a touch back in high school. If the ball goes through the uprights, it is worth the same as a field goal, 3 points. Here’s something to be sure you cover with your team if you are punting. Be absolutely sure you do not interfere with the fair catch. 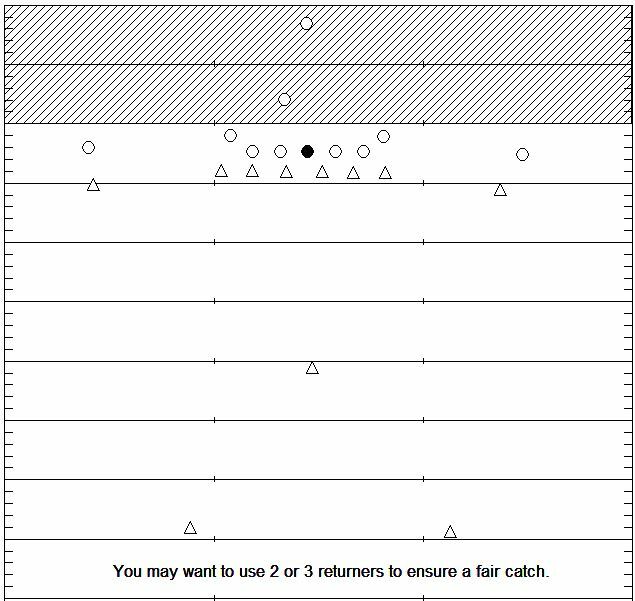 If the team fair catching is interfered with, they will march off 15 yards and the fair catch is still awarded which means they may attempt a free kick. You don’t want to make the kick any easier. 1. The end of the half is an obvious place to use this. Many teams look to get good field position when they force the opponent to punt from their end zone at the end of the half. Based on your timeouts and the time left, you may be better off attempting to fair catch the punt and take the free kick opportunity. Three points on the board at the half can make a difference later in the game. It’s much easier and probably higher percentage than running a shot at the end zone and then aligning for a long field goal. In this situation if you are unsure, you could call for the fair catch attempt and make the decision after. 2. If you have at least one time out left, put your offense out on the field and attempt to draw them offsides with a freeze play. If they don’t jump you can call timeout and align your free kick. If they do jump you can get the free five yards and be closer for your free kick. 3. If you are up at least seven points with under two minutes left, but they have all of their timeouts, you may want to put the extra three points on the board with a free kick. 4. At the end of the game, this is a consideration as well. This is where being a great game manager comes into play. Has this been a tight defensive battle? What is the other team’s ability like in running a two minute or uptempo pace? Do you feel confident about coming out and stopping them after going up by a few points? If the situation warrants taking the lead and playing defense, then when you execute this play may be with more time left than just a last second kick. Good luck this season, and remember that you can only expect your players to be competent in situations which they understand and work in practice. If you haven’t done so yet, get a copy of 101+ Pro Style Pistol Offense Plays. It’s something that you will use as a reference both in and out of season because it’s loaded with offensive ideas and strategies. Get it here. In the next week or two most of us will be in what we all probably consider our favorite time of the year. It’s our opportunity to focus solely on being football coaches. There are no classes to teach, no papers to grade, and our players can focus on football as well. This is a great opportunity to maximize this time when players and coaches have only football to focus on. I’ve written many posts on how to use technology to make our coaching more efficient and effective. The links to all of the can be found in “Advice to Young Coaches Taking on a Coordinator Role.” Now is the time to take advantage of the technology and engage our players before they have more on their plate. We never seem to have enough time to get done what we want, but a teaching method borrowed from classroom teachers can allow us to do more. The method is called flipped learning. I will have an article on this method as well as an online supplemental in August. As I have been planning and preparing for our own camp, one area where I really feel this method can help a team gain advantages is special teams. I always put an emphasis on special teams as head coach in high school, but I was never satisfied with how much time we put in, especially in the meeting room. With offensive and defensive coordinators installing their systems, we always seemed crunched to get special teams meetings in, and there is always that point where you can tell as a coach that the players are ready to hit the field. I am responsible for the kickoff return unit at BW, and I will be creating short videos for the entire unit and each position as well. My goal is to not only allow our players to have a better understanding of our kick return concept, but to develop depth with more players learning how to play the different positions on the unit. Flipped learning allows you extra time for special teams by putting your installations on video and having your players view them on their own time. It also may be an opportunity for some of those down the line players to really learn a special teams unit and step up and give a starter a break. Jason Hahnstadt has a great website on flipped coaching and has a video that is a great example of using technology and the flipped learning method to install punt. Jeff Floyd has a post today on using the time you have now to learn technology. He provides some examples of how flipped coaching can be used to install concepts and drills so time on the field is spent practicing not explaining. If you haven’t seen it yet, please take a look at my iBook available for the iPad. It’s a great offensive resource for coaches regardless of the system used. Get it here.